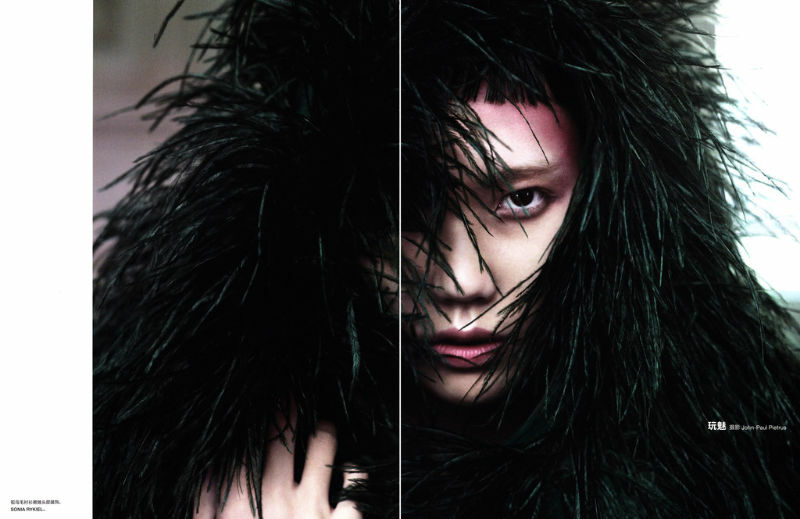 Tao Okamoto is a gown wearing diva for the December issue of Numéro China. Photographed by John-Paul Pietrus and styled by Tim Lim, the Japanese model is full of attitude and grace as she dons a wardrobe of Yves Saint Laurent, Dolce & Gabbana, Christian Dior and more. Kind of wish there was a little more going on in the makeup department, but Tao’s great modeling just saves the spread from looking like a bunch of photos someone took of their friend wearing some fancy dresses after buying a new DSLR. very eerie…Tao looks great in the red dress! ABSOLUTELY! it is an amazing spread, and the fact that it is understated and doesn’t need things which are over the top and over emotional makes it all the more of an achievment. It is beautiful and strong in a very clean and uncomplicated way, it is full of soul and spirit. The colour palate is delectable! I think the negative comments beforehand are quite silly; this is a rare gem: the shoot and Tao! simply but really nice, I hate overstyled photoshooots where the makeup is crazy, hair is crazy, clothes r crazy and the setting is crazy…so I really like this. And the shoes on the last picture are sooo nice, but i’m not convinced to the shape of the heel yet. i love the simplicity yet powerful impact of these images! I like how severe her hair looks here, saves everything from looking too pretty. The shot with her in the tuxedo jacket and light pink shirt- wow. Also, that Antonio Berardi dress has never looked better. I love Tao! her modeling elevates this editorial big time. tao is great. Every great photographer knows that simplicity can be extremely sophisticated. This shoot proves that theory. I love the choice of model, the tailoring of the clothes, and the way camera angles were used to direct the viewers attention. Good job! The hair is really annoying/obedient. I think that style for Asian hair started in the 1920’s in Paris. Can’t remember the tool’s name.